Slicing Into Beauty Pie | A Revolution In Luxe Makeup? Have you had your share of the pie yet? 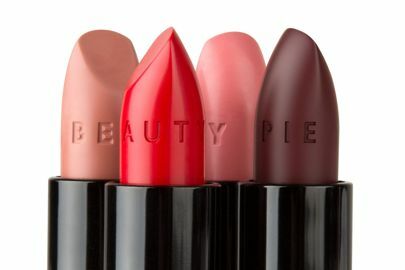 Beauty Pie is a brand new subscription model cosmetics club that is buzzing loudly at the moment in the beauty community. Founded by Marcia Kilgore, the brains behind Bliss skincare and high-street favourite Soap & Glory, the brand certainly seems like it has the credentials. But how does it work and more importantly, does it live up to the enormous hype? The products all sound tremendously exciting, but getting your head around how the model operates is not the easiest. Beauty Pie is not a subscription box, but you do get charged a monthly subscription fee of £10. For this, you are paying for access to buy the cosmetics at a ‘membership price’ that’s quite low – typically under £5 an item. You get an ‘allowance’ of £100 per month (at the full price of the item, not the lower members' price) to spend on the site, which will get you about five or six items. The whole idea is that the products are produced to the same specifications and formulas as designer brand cosmetics in Italy. They don’t say which (I suspect that would be throwing open the doors to lawsuits galore) but with a little search engine Sherlock-ing, you can easily find out the dupes, including Nars, Charlotte Tilbury and Armani. If you don't want to be a member, you can still buy the make-up – but at an over-inflated price (so, £20 for a mascara). One product in particular sold it to me, and being a beauty addict, I decided I wanted to join and see what the fuss was about for myself. All the products deliberately come in lightweight, plain packaging which you may or may not like. Everything does feel quite plasticky, but I quite like the plain black approach. This was the product that really drew me in. I was reading an article about a new wave of face powders that mimic filter technology and make the skin look perfect in photos. It mentioned The Estee Edit’s Flash Photo Powder and Nars Light Reflecting Setting Powder, both at over £20, and then this Beauty Pie offering. I was intrigued. Its supposed to be a micro-fine powder that blurs imperfections and hides fine lines, boosts luminosity, stops shine, protects against dehydration and never cakes. Sounds pretty perfect, right? The powder is white with a blue sheen, but translucent on the skin. The blue particles help to optically enhance skin. There’s no parables, perfumes or talc in there to irritate or block up the skin. I’m not sure this is quite the miracle I was expecting but I do like it a lot. Its very, very finely milled and whisper-light to apply and it does give a nice, faint radiance to the skin. I’m not sure if it blurs my lines that much. The real test will be using this on a night out and seeing if I look like Megan Fox when the photos come back (spoiler: I almost certainly won’t). This is a nice product, especially at the member price, and one I’m likely to buy again. Probably the least impressive of the bunch was this lip liner. Due to the ‘gel’ in the description, I expected this formula to just glide on, but this wasn't the case. I found it dragged quite a bit and it was hard to get a decent application. The shade was also a lot darker than it looked online, which is one of the major hazards with this brand as its not available in stores. I expected a soft fleshy pink whereas this is actually more of a raspberry shade. I’m really unlikely to buy this again. It certainly isn’t ‘a luxury cream/gel texture’ like it claims and the finish is pigmented but drying. A brow pencil with a very fine tip and a spoolie at the other end, this is extremely similar to the Anastasia Brow Wiz pencil. I was debating between this and the brow powder, but decided this would be handier for travelling with. The micro-fine tip is a dream to work with and makes getting neat arches a cinch. The only thing I think this lacks is that I was expecting it to be a bit more pigmented, but I have purchased a slightly too light shade – there are three available and I went for the middle one, fearful of getting the ‘drawn on’ look of too-dark brows. I had really high hopes for this mascara, especially at it features a very short, cupped brush that looked quite unique. I was hoping for something akin to the discontinued Lancôme Fatale mascara which I still hold in my heart as the OG of all lash potions. Sadly, I really dislike this. The coating is extremely uneven and instead of a fan of plumped up lashes, you get a few spider legs here and there! The only way this worked for me was by using another mascara afterwards to comb through and separate out the product. It promises a buildable formula with no clumping, but that’s not what I’ve found so far. Perhaps I haven’t given this enough of a trail, but I certainly wouldn’t say its worth the non-member price of £20. This was the product I was most looking forward to, and the one that disappointed me the most. How can you go wrong with a neutral palette of shadows? They’re always useful and there was a nice mix of shimmer and matte here, including highlighting and defining shades. I really wanted to love this but it fell flat. The shades are pretty but they’re just not pigmented enough. The bar for budget shadows has been set sky-high by brands such as Makeup Revolution and Makeup Geek, who I think produce shadows as good as anything by the likes of Mac for such tiny prices. I suppose I assumed this would be more of the same because, why not? But actually it's really not that great and certainly wouldn’t be worth the full price. The description boasts of ‘high impact colour’ and ‘micronized mineral pigments’ but I just don’t think this stands out. If there's one product that really impressed me out of the range, it would definitely be this primer. I expected it to be more of a clear gel and feel quite silicone-like as it claims to be 'micro-smoothing' but its more like a lotion. It's a very light finish and it smells so gorgeous – of coconut and papaya. This is definitely the nicest-smelling primer I've used! This claims to even out skin tone, hydrate the skin, keep makeup in place and boost radiance, and I'd say it delivers that. Although it hasn't quite toppled my all-time favourite primers, its pretty good and a nice enough option for everyday. So, is Beauty Pie really the revolution it claims to be? Although I still have a lot of products to try from the range before I can definitely judge, so far its a no. The products are nice, but a lot of them are not as good as stuff you can get from cheaper brands, let alone designer (I'm thinking especially of the eyeshadow palette here). I’ve recently developed a new skincare routine composed mainly of products from The Ordinary – another affordable and effective brand whose whole proposition is based around being transparent and cutting out the frills – with fantastic results, so that probably raised my expectations for Beauty Pie to do the same for my make-up bag. However, I’m not sure the logic behind it all works. Yes, you might pay £20 for a designer mascara. But as well as the formula, you are paying for the packaging and the brand – in fact, that’s probably the bulk of the costs. I think most premium beauty lovers are well aware of this. But with Beauty Pie the brand is unknown, the packaging is deliberately no-frills – so I’m not sure you would pay the non-member price just on the basis of the formula. Regardless, the intention is not really for people to buy the products without signing up as a member – everything is geared toward getting you to join. When you do join, I think the model works well, prices are low and very transparent - so they break down for you on the pricing exactly how much for packaging, distribution etc. However, you have to take into account the £10 monthly fee (at a minimum of 3 months) when considering the prices, so they aren't really as low as they seem at first glance. You also get hit with a postage charge of around £6.50, which I think is quite dear, and a ‘bank payment charge’ of 1.8%. So essentially, Beauty Pie has taken the Ryanair model of rock-bottom core pricing supplemented by hefty charges for almost anything else they can think of, in order to claw profit margin back. With that in mind, I don’t really think the central proposition behind the model as its sold to customers is honest. It all depends on if you really believe the formulas are identical to high-end brands – and for some of the products, I don’t. I also believe that so much of what you pay for with a premium brand isn’t really about the product itself, so Beauty Pie trying to compare themselves to that is apples and oranges. Will I be renewing my subscription after three months? Almost definitely not, unless I discover a few more can’t live without items. For beauty magpies like me, its too restrictive – I shop both high and low end cosmetics, but I like to have the choice as to whether I think each product is worth it. And whether its ‘worth it’ is a complex personal alchemy that interlinks product, performance, packaging and brand, as well as price. I still have two months of membership left though, so watch this space as I try more of their products and who knows, perhaps find a few I can't live with out.